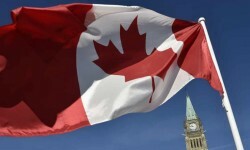 2 Apr 19 - Canada has imposed a landmark carbon tax on four provinces which had defied Ottawa’s push to combat climate change. 12 Oct 18 - When Canadian Prime Minister Justin Trudeau swept into power in 2015, he pledged to make fighting climate change a top priority for his government. 29 Jun 18 - The world’s second-largest national park is under threat from a destructive combination of climate change, oil and gas development and hydroelectric projects. 7 Jun 18 - The Canadian government’s decision to purchase Kinder Morgan’s Trans Mountain pipeline project shortly after ratifying the Paris Agreement on climate change creates an interesting paradox and a national challenge. 4 May 18 - Canada says that setting a nationwide carbon price could help to cut emissions by 90 million tonnes while maintaining a strong economy. 19 Apr 18 - Justin Trudeau has said Canada’s government is prepared to use taxpayer dollars to push forward plans for a controversial pipeline expansion, despite protests and efforts by a provincial government to halt the project. 29 Mar 18 - One of the most aggressive campaigns to fight global warming is happening in a Canadian province. There’s just one problem: the same place is also home to some of the dirtiest oil in the world. 7 Mar 18 - Ontario has participated in its first auction of carbon allowances as part of the Western Climate Initiative, selling 23,743,316 current-vintage allowances at a price of $C18.44 ($NZ19.66). 2 Mar 18 - The Canadian Government plans to invest $1.3 billion to preserve the country’s land, oceans and wildlife. 25 Jan 18 - In a letter to Prime Minister Justin Trudeau, 250 Canadian scientists highlight their concern over the imminent end of a research programme to better understand climate change.